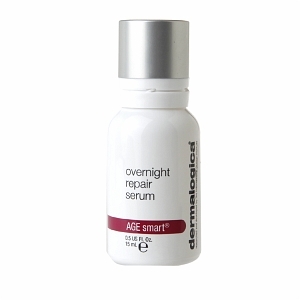 Dermalogica AGE SmartvOvernight Repair Serum is a powerful peptide serum with Argan and Rose oils to help stimulate cellular repair overnight. It maximizes nighttime skin repair to help minimize fine lines and increase luminosity by stimulating collagen production to firm and renew resilience. Driections: After cleansing, smooth 4-6 drops into skin or blend with your nighttime treatment cream. 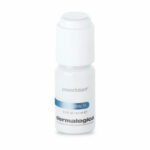 Dermalogica AGE Smart Overnight Repair Serum Ingredients: Helianthus Annuus (Sunflower) Seed Oil, Argania Spinosa Kernel Oil, Rosa Moschata Seed Oil, Portulaca Pilosa Extract, Sucrose Cocoate, Palmitoyl Tripeptide-38, Jasminum Officinale (Jasmine) Oil, Alaria Esculenta Extract, Cananga Odorata Flower Oil, Aniba Rosaeodora (Rosewood) Wood Oil, Eugenia Caryophylus (Clove) Flower Oil, Pelargonium Graveolens Oil, Citrus Medica Limonum (Lemon) Peel Oil, Rose Flower Oil, Geranium Maculatum Oil, Citrus Aurantium Bergamia, Ocimum Basilicum (Basil) Oil, Cymbopogon Schoenanthus Oil, Citrus Aurantium Dulcis (Orange) Peel Oil, Daucus Carota Sativa (Carrot) Seed Oil, Murraya Koenigii Leaf Oil, Cinnamomum Zeylanicum Leaf Oil, Sesamum Indicum (Sesame) Seed Oil, Rosmarinus Officinalis (Rosemary) Leaf Extract, Caprylic/Capric Triglyceride, Citronellol, Eugenol, Limonene, Geraniol, Linalool, Benzyl Benzoate, Benzyl Salicylate, Cetearyl Ethylhexanoate, Sorbitan Isostearate.